The Business Relationship Management Playbook guides the reader through a framework aimed at leveraging a business relationship management (BRM) capability to drive business value, build strategic business partnerships, and evolve enterprise culture. While most organizations have some level of BRM capability, the Business Relationship Management Playbook is designed to help business professionals assess BRM capability health and create plans for improvement that drive increased value across the enterprise. The Business Relationship Management Playbook’s content release is supported by the Business Relationship Management Strategic Partnering Approach Workshop, dedicated to enterprise facilitation. 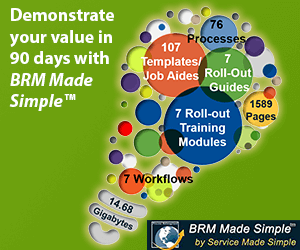 The Business Relationship Management Strategic Partnering approach serves as an addition to BRM Institute’s current BRM certification programs, BRMP® and CBRM®, which are designed to be delivered and received at an individual level. Any organization that is launching a BRM capability, working to improve its BRM capability, or is interested in taking its successful BRM capability to the next level can benefit from team engagement in Business Relationship Management Strategic Partnering sessions. Development of the BRM Playbook is made possible by the BRM Playbook Content Development Team, which is comprised of renowned Business Relationship Management (BRM) experts, trainers, game-changing BRM practitioners, and senior business executives ranging in academics, government, and industry from all around the globe. Generously volunteering their time to add value, experience and rigor to the body of knowledge, Business Relationship Management Institute is grateful to these people and their organizations, provided here.